Largely ignored in its time, gritty underground magazine Provoke, published 1968-1969 is now recognised as a major milestone in the history of photography. 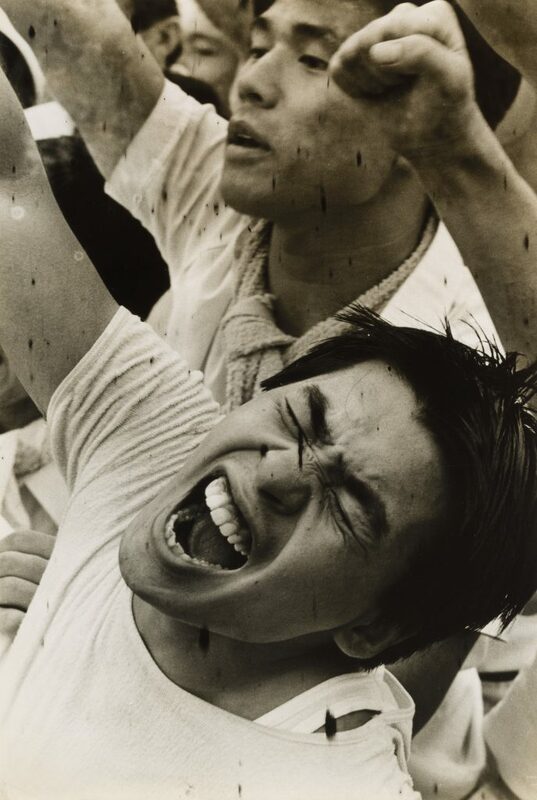 The anti-establishment group of photographers, philosophers and poets polarised the best of Sixties Japanese photography, promoting the printed image in all its forms (press, books, magazines). As both a manifesto and collective work, Provoke assigned photography with a new role in response to the tumultuous violence that shook Japanese society in key work by its members: Takuma Nakahira (For a language to come), Daido Moriyama (Accident), Yutaka Takanashi (Towards the city); and echoed the emergence of Japanese performance art and its great exponents: Natsuyuki Nakanishi, Jirō Takamatsu, Kōji Enokura, Shuji Terayama…. The language therefore becomes raw, blurry and grainy (are, bure and boke in Japanese) pushing photography to the fringes of legibility. The blurriness undermines the power of the single image. Juxtaposition, collage and repetition challenge the authority of the sequence and narrative. In the context of a society where consumption was obsessive; where the profusion of media images makes all reality virtual and where art itself is instrumentalised, the unfeasibility of representing and honouring absurdity and favouring chaos turns into the only possible gesture. Provoke therefore showcases the complex connections between photography and language, art and resistance without providing any answers. Diane Dufour was director from 2000 to 2007 of Magnum Photos. She created LE BAL in 2010 with Raymond Depardon, contemporary space dedicated to image-document under all its forms (photography, video, cinema, new medias).